Android O Beta: Launched! New Features Here. – Biovolt's Offical Tech Blog. Google I/O 2017: Android O Beta Now Available, New Features Revealed. Android O beta version is now rolling out. New features include Smart Text Selection, Notification Dots. Android Vitals offers new tools to developers. Google has just released the second Android O developer preview during Google I/O. We’re working on a video, but you can read text versions of what’s new below. Like last year, Google dropped the first preview build for the upcoming Android version a couple of months ahead of I/O. The post that follows is divided up between all the new Android O features in the second dev preview, followed by what was new in the initial alpha preview in the second half. As always, we’ve been busy and have brought together all the changes, features and things you should know about Android O.
Android O, Google’s next major Android release, had its moment in the sun at the Google I/O keynote address at the search giant’s annual developers conference in California. 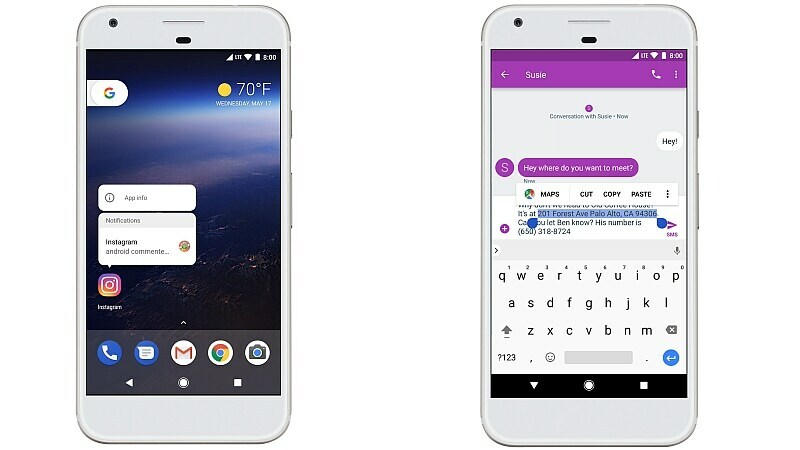 The Android O is the successor to Android Nougat and Google highlighted some new features to expect with the new Developer Preview 2 release, which is now available as public beta users globally as part of the Android O Beta Program. The company also announced Android Go, aimed at low-end devices, and said the AI-based Google Assistant is headed to iPhones and other devices. Some Android O features, such as picture-in-picture, notification channels and improved keyboard navigation, were already publicly known since Google rolled out the first Developer Preview of Android O. At I/O 2017, Google also mentioned a new feature called Smart Text Selection. This new feature improves copy and paste through the help of machine learning, which can now recognise contexts on the screen such as an address and will be able to copy the whole thing with a double tap. It will also be able to bring up Maps when you do to navigate to the address. Android O Notification Dots is a new way for developers to notify users about about activity on the app, driving engagement. Google did not go into detail regarding Android O’s other features, and is probably saving that for a later day when it officially starts rolling out the final build. Despite the beta availability, Google is still calling this Android O Developers Preview 2. Android O also touts better battery efficiency, and Google is providing that through Android Vitals, which focuses on optimising battery life, startup time, graphic rendering time, and stability. Google has introduced new tools for developers such as system optimisations, background apps limits, and Android Vitals Dashboards in the Play Console. Google’s annual developers conference kicked off highlighting the company’s efforts in AI and machine learning with Assistant taking centre stage. The company announced that Assistant will be coming to the iPhone as well as new services such as Google Lens and new features for Gmail and Google Photos. From what we can see so far Android O is shaping up to follow very much in Nougat’s footsteps, completing some of the work started in Nougat and further strengthening the granular nature of control in Android. User-facing notification and permission management are better than ever before and Android itself is taking an even more aggressive stance to apps that treat precious system resources with reckless abandon. Other than apparently having an entire team whose job it is to constantly come up with new ways to group things in the Settings menu, there are very little superficial changes here. Ushering in the next phase of Android peripherals is clearly a focus too, with better support for Bluetooth audio and hardware keyboards. But Android O is also catching up on a lot we’ve been waiting for, from adaptive icons, to the Autofill APIs, picture-in-picture mode, app badges and nav bar tweaks. The first and second developer previews are typically the most feature-rich, with only a few notable additions in subsequent previews but a lot more subtractions as Google gets a grip on what’s possible in the time remaining and where to prioritize its efforts. I’m hoping the system-wide dark theme makes the cut this time around, but as you can probably see, the vast majority of the changes Android O has in store are of the background variety. Google claims it’s made some other changes in the OS that will make Android more modular and thus expedite Android updates, but I’ll believe that when I see it, not before. Previous Previous post: Update: What Google Assistant For iPhone! Next Next post: Warning! Another Cyber-Attack On The Way!